Employers have numerous payroll tax withholding and payment obligations. Of the paramount importance is the proper payment of what are commonly known as FICA taxes. The Federal Insurance Contributions Act (FICA) is the federal law that requires withholding from an employee's wages as well as an employer's portion of the taxes that must be paid to fund Social Security and Medicare. On October 22, 2014, the Social Security Administration (SSA) announced an upward cost-of-living adjustment for the Social Security taxable wage limit. For calendar year 2015, the amount of earnings taxable for Social Security (Old Age, Survivors and Disability Insurance, or “OASDI”) will increase from $117,000 to $118,500. The employee and employer tax rate will remain unchanged at 6.2%. With this increase in taxable wages, the maximum Social Security tax payable by an employee will be $7,347.00, an increase of $93.00 from the current maximum tax of $7,254.00. Employers will match the employee’s tax. In 1993, the Omnibus Budget Reconciliation Act removed the taxable wage limit for the Medicare tax beginning in 1994 and years thereafter. Therefore, there is no maximum employee or employer contribution amount for Medicare tax for 2015. All covered wages will be subject to Medicare tax at a rate of 1.45%. Employers will match the employee’s tax. As of January 2013, individuals with earned income of more than $200,000 ($250,000 for married couples filing jointly, $125,000 for married couples filing separately, and $200,000 for filing single) pay an additional 0.9% in Medicare taxes. For withholding tax purposes, covered wages in excess of $200,000 will be taxed at a rate of 2.35% (1.45% + 0.9%), regardless of filing status. The Additional Medicare Tax is not matched by employers. Depending on the amount of taxable wages, the combined Social Security and Medicare employee tax rate will range from 7.65% (6.20% + 1.45%) to 8.55% (6.2% + 1.45% + 0.9% on Medicare wages in excess of $200,000). The combined employer rate will remain 7.65%. For a copy of the Social Security Fact Sheet with the 2015 changes, please click here. On October 23, 2014, the Internal Revenue Service (IRS) announced cost-of-living adjustments applicable to dollar limitations for pension plans and other retirement-related items for Tax Year 2015. In general, many of the pension plan limitations will change for 2015 because the increase in the cost-of-living index met the statutory thresholds that trigger their adjustment. However, other limitations will remain unchanged because the increase in the index did not meet the statutory thresholds that trigger their adjustment. 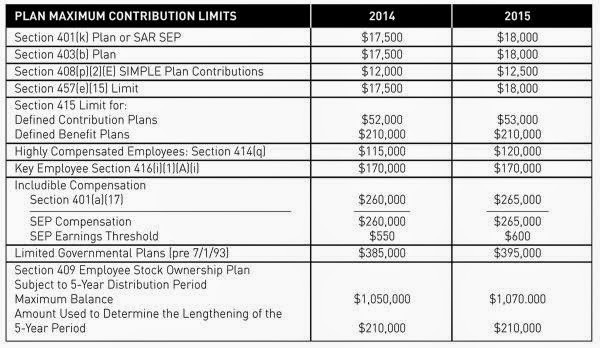 The dollar limitation under Section 414(v)(2)(B)(i) for catch-up contributions to an applicable employer plan other than a plan described in Section 401(k)(11) or Section 408(p) for individuals aged 50 or over increases from $5,500 to $6,000. The dollar limitation under Section 414(v)(2)(B)(ii) for catch-up contributions to an applicable employer plan described in Section 401(k)(11) or Section 408(p) for individuals aged 50 or over is increased from $2,500 to $3,000.